Dirlot castle is believed to have been built during the 14th century by Sir Reginald de Cheyne. It later passed to the Gunns, Sutherlands, and the MacKays. 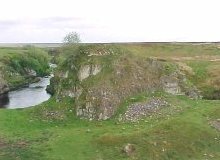 Although small by comparison with other Caithness strongholds, Dirlot's position on a high pinnacle of rock beside the River Thurso is without doubt the most unusual and picturesque of all the counties castles. 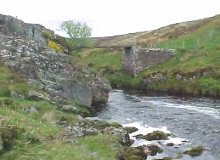 Situated 3 miles downstream from Loch More it sits beside a deep pool before the river enters a deep gorge. When the heather is in full bloom there is truly no nicer spot in the county to have a late summer picnic. The pool beside which the castle stands is itself a source of mystery and intrigue. Local legend tells that amidst the depths of the pool lies a hidden treasure, which is guarded by a fearsome demon in the form of a water horse. Many people have tried to find the hidden secret, but none have survived the dive. It is said that following a treasure hunt (using grapple hooks) the only thing to be retrieved were the organs of the swimmers that never surfaced to tell of the mystery of the pool at Dirlot. Follow the B874 south of Halkirk to Westerdale, turn right, and keep heading southwest for 3-½ km until you see a track that leads through a sand quarry. 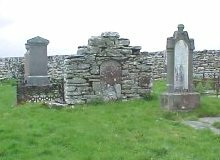 Continue down the track for ½ km until you spot an old graveyard. Find somewhere convenient to park. Head through the farm gate (please remember to follow the country code and obey all signs) and head down to the river following the trodden path.